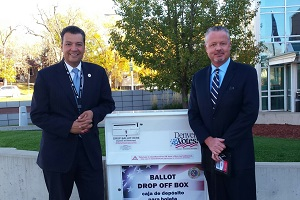 I joined Secretary of State Alex Padilla and a delegation of lawmakers this week to observe Denver's vote center elections. Members of the Senate and Assembly were able to see first hand how SB 450 would change the voter experience in California. The Election Funding Project will assess election funding in other states and in California in order to develop more sustainable models. Follow the link to participate in this important research. The County Clerks division of CACEO has scheduled a joint Mock Hearing in the Capitol during the New Law Conference on December 10th. Full details are included in the conference materials. Plans are coming together for CACEO's panel discussion, which will be taking place on Thursday, January 14, 2016 on the campus of UCLA. This unique forum will focus on re-imagining voting in California. Look for a packet of information coming out in the next few weeks. Clerks of the Board: Got a Legislative Proposal for CACEO Sponsorship? Clerks of the Board of Supervisors may use a new legislative proposal form with which to submit proposals for CACEO’s COB Legislative Committee to consider. The form is available on CACEO’s Web site as a fillable pdf at www.caceo58.org. Click on Leg. Committees, click on Clerk of the Board, then click on Clerk of the Board Legislative Proposal Form. Follow the link for more info.